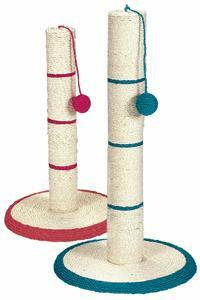 Cat Scratching Posts for your cats Entertaiment, your cat will not only be keeping their claws trim but giving them some exercise and play. Why not spray or sprinkle some catnip spray onto the post, to really get your cat in the spirit. For your pet's safety, examine the toy from time to time for wear and tear and replace when appropriate. Pets should be supervised when playing with toys.